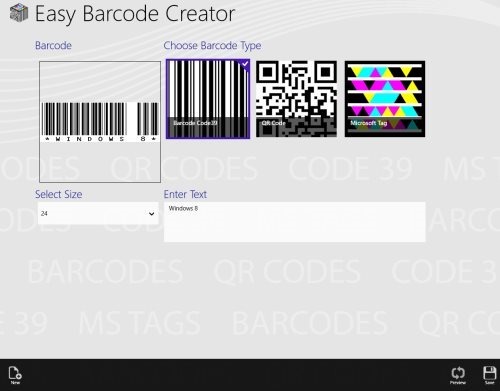 Easy Barcode Creator is a free Windows 8 barcode generator app that lets you create QR Codes, Microsoft Tags, Plain Barcode Code 3 of 9. Basically, you can generate MS Tags, QR codes from plain text, important numbers, or from the URLs of various websites. Before creating a barcode, you need to Choose a Barcode Type, Select a Size, and Enter Text ? as soon as you enter a text, it will automatically generate a preview in the ‘Barcode’ box. Once you are done satisfied with the preview of the barcode that has been generated, you can now save it to you local machine in PNG file format. Now, to create another code, just right-click anywhere on the screen and click on ‘New’ button. You can easily scan a barcode from Windows screen. The live tile shows the last created barcode or MS Tag. However, for generating MS Tags, you need to first set up Access Token in Barcode Settings Screen. It’s very easy to generate as many barcodes as you need. Go ahead and download Easy Barcode Creator app in Windows 8 now. Barcode Generator is another app that lets you create 2D barcodes with various formats that can be used by Tablets and Smartphones. You can easily generate barcodes consisting your Facebook profile page, a phone number, business card, Flickr home page, your Email address, plain text, Wi-Fi Network, Web URL, YouTube Videos, and the like. On the home page of this barcode generator Windows 8 app, you will see all the recently saved barcodes, and you can easily select any one from the templates given on the right side. You need to input the text, Web address, number, profile name, or whatever out of which you want to generate a new barcode. You can save a created barcode in your local machine in Image file format. To view your barcode history, you need to click on ‘Last Generated’ button given on the home page of the screen. You can also delete an existing barcode, share a barcode with others from within the app, or just pin to start a specific barcode. It’s very simple and easy to generate barcode using this Windows 8 barcode generator app. 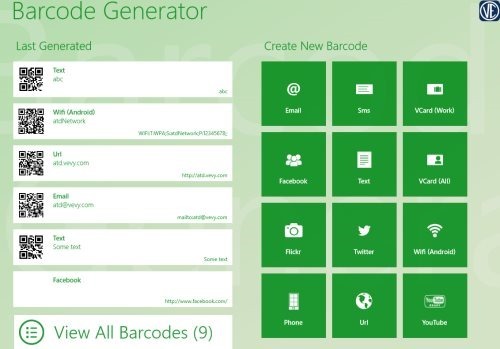 Download Barcode Generator App In Windows 8 now. Also, check out our posts on Apps To Ask Questions, Webcam, and Currency converter Apps. QR Barcode Generator is a simple app that lets you generate barcode in a matter of seconds. You can easily use these barcodes with your electronic products, mobile products, or on your websites. You can also save a generated barcode on your local Windows 8 machine as a PNG file format. Also, you can save it to clipboard and paste it anywhere you want to. The home screen of the app comes with a rectangular box where you need to input the text from which you want to create a QR code ? click on ‘Generate’ button ? you will get the result immediately. Simple as that. Go ahead and download QR Barcode Generator app in Windows 8 now. Whoz Barcode Generator brings you a complete kit of tools that let you create barcodes of different standards such as EAN-13, EAN-8, Code 39, Code 128, Codabar, ITF, UPC-A, QR Code, and PDF-417. It’s very easy to generate a barcode using this app. All you need to do is just ‘Select Barcode Type’ and then ‘Enter Barcode ID’. Each barcode type tells you what all would you require to input in the box. As you input the right text or digits, it will come up with barcode that you can use it on your website or wherever you want to. 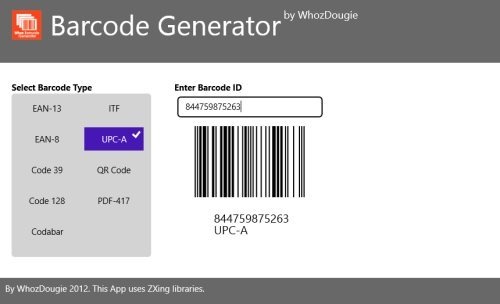 Go ahead and download Whoz Barcode Generator app in Windows 8 now.